This unit was inspired by my Masters in Education research into web-based learning. I explored Scavenger Hunts and Webquests, and was challenged to use a different tool and method of delivering learning to that with which I was experienced. This unit combines prior teaching around both the novel Room 13, and an exploration of horror in a unit entitled: 'What Scares Us?' It also brings together my research around web-based learning and design. This unit is the first site I have built using Weebly, and the first time I have used a Scavenger Hunt - which I have adapted for my learners to incorporate some elements of Webquests for clarity. Room 13 is a novel aimed at young readers, written by Robert Swindells, master of literature for school children. It concerns a school trip to Whitby, alleged resting place of Dracula's last remains. The school children stay in a hotel, which is not what it first seems, and they have to overcome an evil presence and use their knowledge of vampires to save their friend. The text is challenging for second language learners and will introduce them to a great deal of colloquialisms, which is what discerns native speakers from learned language speakers - and ultimately, what helps second language learners gain excellent grades. It also provides an excellent backdrop for their Scavenger Hunt - which in turn, will enhance their understanding of the novel. Effective Webquests should engage learners in problem-solving where they are allowed to draw their own conclusions. The resources provided allow for many different possible results. the questions provided should require extensive research and problem-solving - they should not constitute a fact-finding mission. appropriate, valid and there should be a range of multi-media sources. a curriculum correlated objective where a synthesis of the research is presented. The activity I have designed adheres to the elements of the Scavenger Hunt but follows the structure of the Webquest. This unit is for second language learners who need a more structured method of learning to lead them into their final outcome, which is why I have decided to use the guided research methodology of the Scavenger Hunt, but with the clear process methodology of the Webquest. The activity is part of a larger unit that includes the study of a novel, Room 13, all based around the topic of vampires. 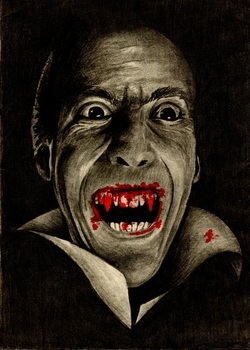 The hunt is intended to teach essential reading, writing and speaking skills as well as help provide a background to the myth surrounding the fictional character, Count Dracula, to aid comprehension of the novel. Whilst literature is not required as a component of the CIE IGCSE Second Language Course, it is important that these learners are exposed to fiction, particularly as these skills are necessary for success in the IB DP English B course, which is their progression. In this sense, this whole unit is backward by design to prepare learners with the necessary skill set for success not only in their current course, but also for later study. If you are new to VOICETHREAD, watch these videos to help you set up and manage your account.